We visit Champagne more frequently than most, but for fanatics like us, its still not nearly enough. Hence when we do make the journey we like to pack out our itinerary, filling every available minute with tastings and tours. It should come as no surprise then, that although our latest trip during August bank holiday didn’t see us depart London until early-afternoon on Sunday, our first scheduled meeting was just a few hours later in our home-away-from-home, Reims. 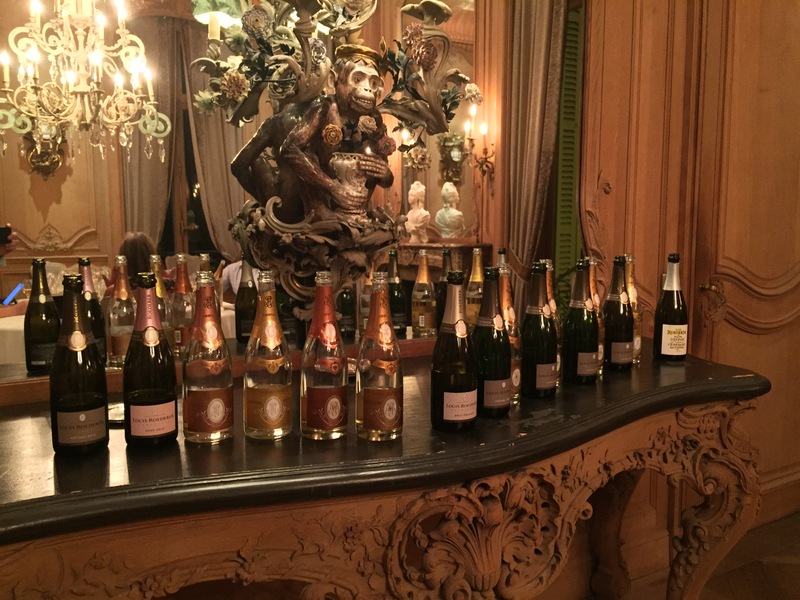 Fittingly, it was Jean-Baptiste Lécaillon, the godfather of Champagne and Louis Roederer’s leading man who matched our passion and kindly volunteered his time to host a magnificent dinner and tasting. 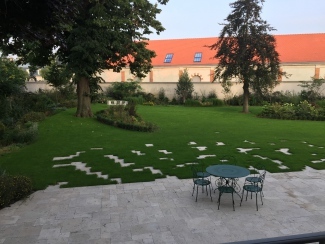 Greeting us warmly as the sun set over the gardens of the Roederer family mansion, Lécaillon could barely contain his excitement for the impending harvest and began with an overview of the 2017 season. Although an unusually cold April brought frost to parts of the region and the continuously wet and warm period from May-July has fostered the growth of botrytis in the Aube, Lécaillon is optimistic, likening the year to 2007. 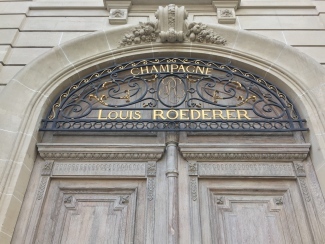 Roederer were expecting the arrival of their annual team of more than 600 pickers later that week and Lécaillon shared with us their unique approach to this momentous operation. Since sorting tables went out of fashion after WWII, Roederer now use their experienced workers to ensure the best grapes are pressed: “Our pickers sort. Whereas others pay by quantity, we pay by the quality,” he said. The first champagne we tasted was the distinctive Brut Nature 2009. Described as a “field blend”, the idea behind this revolutionary wine is to stay as close as possible to the terroir. Produced solely from the soil of Cumières, all the grapes are picked on the same day and co-pressed, and the juice is co-fermented and not re-blended. Initially intending it to be an extra brut champagne, Lécaillon was so impressed with the maturity and ripeness of this unusual clay area that it became a zero dosage. Difficult to produce as a very warm summer is needed to reach the required ripeness, just two vintages have so far been released – 2006 and 2009 – with 2012 and 2015 to follow. Has a lovely richness to the nose, loads of peaches and creaminess that goes on and on. Has a hint of nice bitterness and chalkiness on the tongue. A round mouth-feel with a touch of salinity on the end. 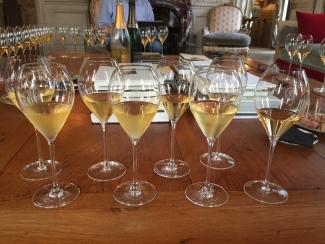 We then progressed to our main topic: a comparison of four pairs of Brut Vintage and Cristal from the same year. 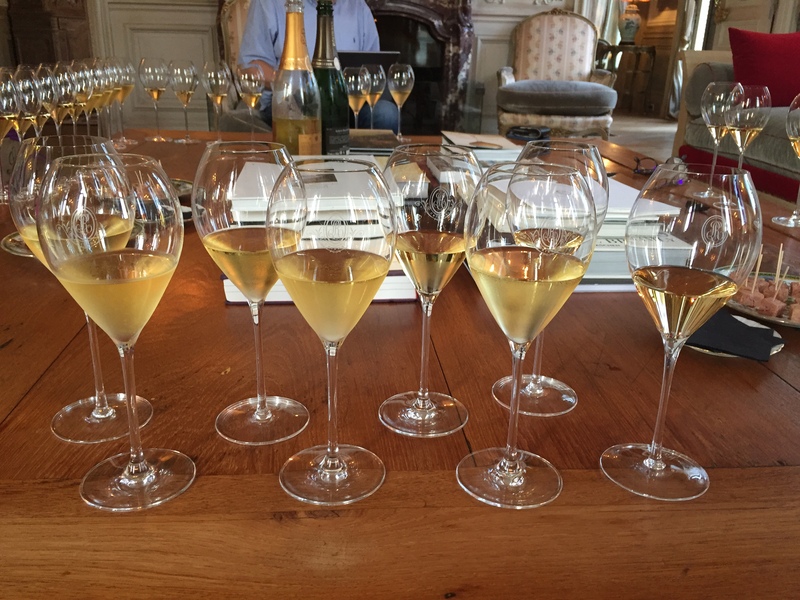 Introducing the idea that a comparison of vintage and prestige cuvée is an experiment in style – which originates from terroir – and winemaker vision, Lécaillon talked us through some of their differences. Firstly, he attempts to make a Brut Vintage champagne every year, where Cristal is produced just two years out of three. Origin, number of contributing plots, length of ageing, number of disgorgements and Pinot Noir content are all key differences at Roederer. Brut Vintage is typically a blend of 7-10 parcels, is aged for four years on the lees and receives just one disgorgement. Lécaillon has gradually been increasing the proportion of Pinot Noir in the vintage blend to as much as 80%. 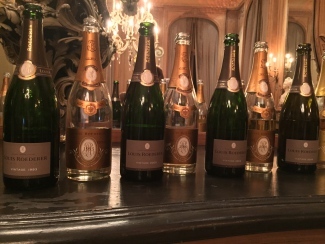 The prestige cuvée Cristal is ‘estate bottled’, meaning an initial bend using all of the 45 Cristal plots is produced, before Lécaillon perfects the assemblage, resulting in a balanced final blend of 32-35 parcels (just two vintages have been produced using all 45 parcels – the outstanding 2002 and highly anticipated 2015). Further, the Cristal grapes are all from mid-slope origin – where favourable weather exposure produces riper fruit – the wine is aged on the lees for two years longer and the House carry out 3-4 disgorgements of each vintage of their prestige cuvée. Loads of ripe fruits and yellow plum character. Packed full of chalkiness, richness and ripe fruits. Good length. Nose is still quite tight. Has a dominant chalk character, bright acidty and loads of fruit. Very structured and linear and a bright, crisp finish. Tasting deliciously round already. Initial meaty character with a real creaminess and a hint of mushroom. Bright acidty showing with multiple fruit layers and richness. A touch of iodine. More steely and lovely richness to fruit. Still seems very youthful, great mouth-feel, texture and weight of fruit. Fresh lemon, citrus and orange flavours abundant. Hardly seems ready. Quite forward, softer acidity. Seems much gentler on the palate, quite ripe and round. Soft and round fruit style but still some grip from the acidity. Long length. Some creaminess starting to come through on the nose. Bundles of fruit, like dried apricots. Seems less chalky in character. Some of that nice vanilla creaminess on the finish. Lots of light honey character. Seems very soft and round on the vintage. Acidity seems quite high. Has lots of flinty chalk on the nose. Has started to lose some of the richness of fruit but has a freshness and chalkiness still. Delicious peaches and apricot flavour. 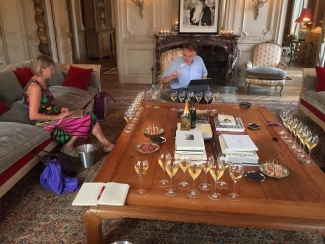 Lécaillon had then prepared an insightful workshop centred around a comparison of four blends of Roederer’s famous non-vintage cuvée with different base vintages. Each creation of Brut Premier is a subtly different blend, with varying grape varietal contributions, reserve wine content and percentage of malolactic fermentation. Typically the reserve wine content is a blend of 7-8 vintages, 7% of which Lécaillon described as “really old”. Of the 25% reserves, 18% is wine from the previous year kept in stainless-steel vats. “Reserve wines have to respect the base year,” he added. Lovely fresh pear notes and slightly exotic character. Loads of acidty. More subdued on the nose. Seems slightly dry palate. Has quite a lot of fruit just not the sweetness/juicy character. Absolutely jumps out of the glass! Amazingly steely and lush vibrancy. Lots of lime and lemon character followed by layers of dried fruits. Lees character seems prominent in this, not so much in others. A+++. Very ripe and showing some lovely richness. Right now doesn’t have the freshness of acidity and lift of the 2008. Looking to the future, Lécaillon then shared with us some exciting new releases hitting the market soon. First, we tasted the new 2012 vintage releases, due for launch early next year. A vintage that has received much attention already, 2012 is expected to follow in the footsteps of 2002 and 2008. Lécaillon talked us through the production of their vintage rosé: long maceration of the Pinot Noir at 4°C until the colour is right, then the addition of the Chardonnay juice and fermentation together. 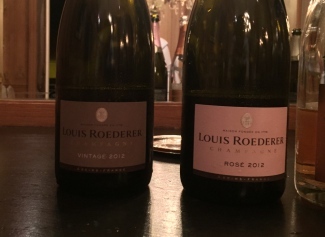 Because the colour is inconsistent, Roederer do not make a non-vintage rosé. Big, broad fruit character and lovely mouth-feel. Rich with hints of smoke. Really quite lovely already for a young vintage. Dry finish. In case he didn’t have our full attention already, Lécaillon made certain with his introduction to Cristal 2008. “Potentially better than 2002,” he said, “2008 is the 1996 of our dreams.” He told us that picking commenced a week too early in 1996 and the House should have done more malo, “so we improved on this in 2008.” The bottles we tasted were a trial sample, as Lécaillon planned to disgorge the first batch the following month. 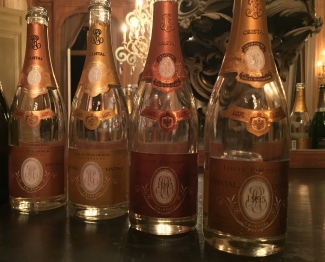 With 2008 representing the first time a Cristal has been launched at 10 years old and flaunting the lowest ever dosage at 8 g/l, this is set to be a ground-breaking release. Cristal lovers standby – you won’t be able to fill your cellars until Spring 2018. Amazing freshness, just jumps out of the glass. Has great structure, mouth-feel and a lovely mineral-ness that goes on and on. Bright acidity and fruit explosion. Such youth. Lots of red fruit and raspberry flavour. Wonderfully balanced and with impressive richness. Seems really powerful, even at this age. Very, very good. When a winemaker like Lécaillon says the next wine to be tasted has been twenty years in the making, you know you’re in for a treat. 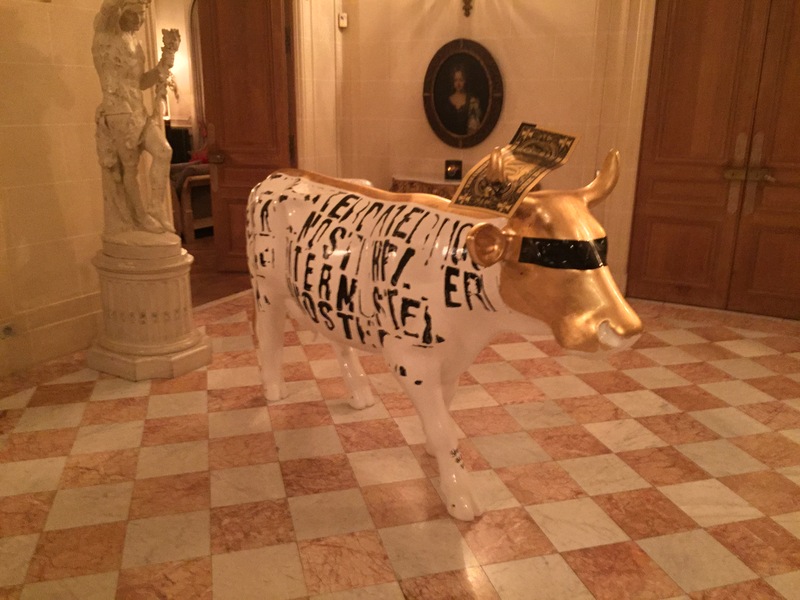 Introducing: Cristal Vinothèque. This late-release edition is a new feature in the Roederer portfolio, the first vintage of which will be Cristal Vinothèque 1995. Originally released in 2002, less than 1,000 bottles were kept on the lees for a total thirteen years, disgorged with just 7-8 g/l residual sugar added (2 g/l less than the original dosage) and then put back on cork for seven years before release. “Twenty years from vintage is always a nice window,” Lécaillon told us, adding that they have been carrying out disgorgement trials every year to pick the optimum time. Cristal Vinothèque 1995 will be launched in November 2017 and Vinothèque will become a regular release – complete with a new, distinctive label – for the main Cristal and Cristal Rosé vintages – upcoming releases will be 1996, 1997 and 1999. Intense nose. Amazing tropical flavours and incredible ripeness. Great mouth-feel and the length goes on and on. Lovely acidity and a delightful lees character on the finish. Superb. Very pale hint of colour. Has that lovely rich red fruit coming through. Roses and subtle aromatics are way up there. Has such lovely elegance and freshness and a length that goes on and on. Seems very subtle but very big. Drawing our tasting to a close, Champagne’s very own Santa Claus had one last surprise – a bottle of Cristal 1983. As expected, biodynamic methods of farming was a topic we discussed and re-discussed throughout the evening and whilst tasting that stunningly youthful thirty-four year old prestige cuvée – a champagne produced 100% non-biodynamically – we asked Lécaillon if the future goal was to reach 100% biodynamic production. With all the poetic precision we’ve come to expect from the man, he replied simply: “I am not a biodynamist, I am not a chemist, my goal is to make my wine taste beautiful.” And in that he succeeds, year upon year. Typical concentration of lime flavour. Loads of acidity and mushroom notes. The length goes on and on and this still has a nice, although soft, spritz. 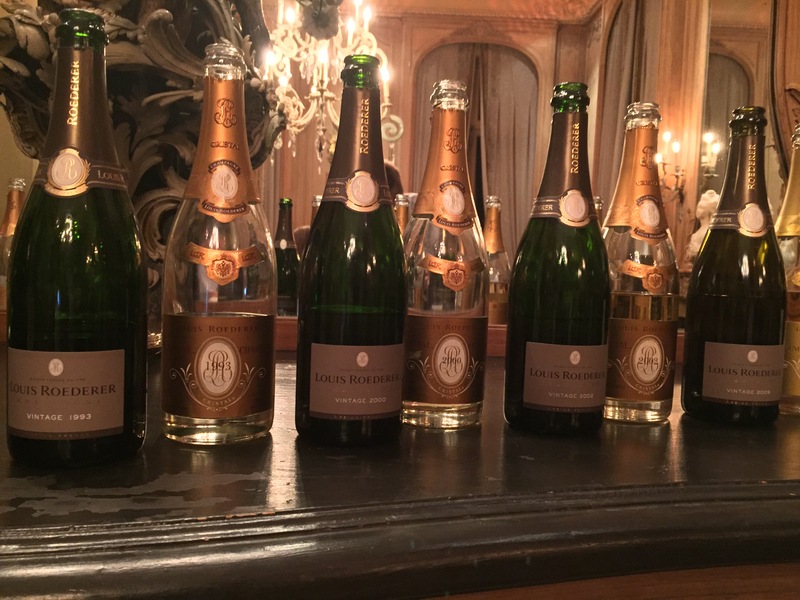 Each bottle of Louis Roederer Brut Premier NV and Cristal has an ID code on the back label. This can be inputted into a smartphone app to reveal the base year, bottling year and disgorgement dates of that bottle. Download the Champagne Louis Roederer App for iOS devices here.